VO Senior Outreach & Strategy Coordinator, Vic Sjodin, has leafleted 77 campuses this semester, reaching more than 52,000 students! Vic Sjodin at USC, where he, Rachel Curit, and Steven Litrov reached 3,000 students on 2/20/14. Vic is known amongst many of his peers as one of the most effective leafleters ever, and plays a big role in advising Adopt a College activists on how to reach the most people per hour spent leafleting. 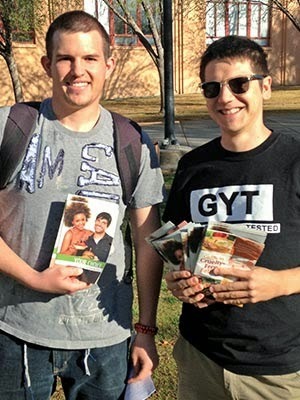 Traveling throughout the US, Canada, and Mexico since the spring of 2008, Vic has placed Vegan Outreach booklets into the hands of an astounding 720,000+ individuals! Joseph and Brandon took booklets to share. Lindy wants to go vegan after reading Your Choice. New vegan Mark got a Guide and advice from Vic. 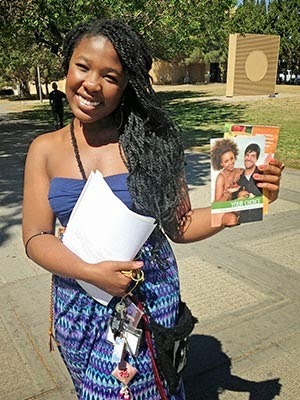 TTU student Nyla now wants to go vegan. “Monster day! 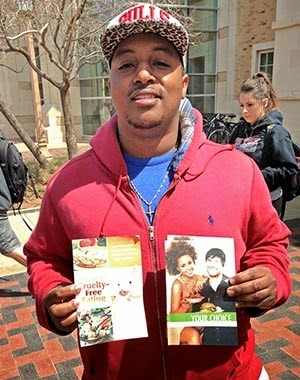 Josh was unleashed on America’s campuses for the second time. We met Mark, who went vegan a week ago; and Nyla, who wants to go vegan after reading our booklets. If you’d like to support VO’s world-changing outreach, please visit Vic’s Team Vegan page here.